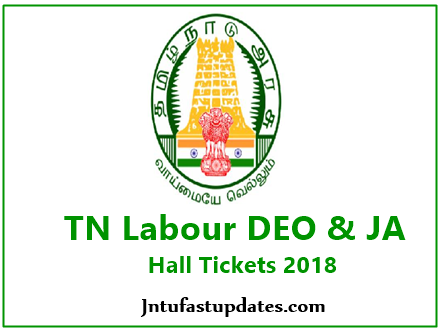 TN Labour DEO & JA Hall Tickets 2018-19 Download: Tamil Nadu Construction Workers Welfare Board (TNCWWB) has scheduled the Data Entry Operator (DEO) and Junior Assistant examination in the month of December. To attend the test, applicants must initially require to download the hall ticket. Applicants can download TNCWWB DEO Hall tickets from its official website, labour.tn.gov.in. After downloading the hall tickets, check the details of the examination venue, date and timings details. Hall ticket/admit card is the most important document to carry to the examination. All the applicants who have applied for Tamil Nadu DEO, Junior Assistant Posts can download the hall ticket and observe the details of their examination center, timings details. Aspirants can check more details of TN Labour Department DEO Hall ticket 2018 download, availability date and other details from this article. Tamil Nadu Construction Workers Welfare Board (TNCWWB) is the labour welfare department that hires the suitable candidates into various posts every year. The TNCWWB has recently advertised 177 Data Entry Operator and Junior Assistant posts. Many of the suitable aspirates have applied for the announced posts during the application dates. The organization shortlists the suitable candidates through merit basis. It is going to conduct the written test and interview rounds for the applicants. The applicants who qualify these rounds with good merit will be considered for the announced posts. Hence the aspirants applied for Tamil Nadu Labour Department jobs must prepare well to qualify the selection rounds. Applicants initially required to attend the Tamil Nadu Labour Department written test for DEO and Jr. Assistant posts. All the applicants applied for Tamil Nadu Labour Department posts can download the hall ticket from the TNCWWB official portal, labour.tn.gov.in. The admit cards will be accessible to download before 10 days of the examination (approximately). Hence the applicants can stay checking the official portal for the latest updates. Applicants must carry the admit cards while going to the examination. Hall ticket/admit card is the essential document; the examination officers will allow the candidates to the examination only after verifying their admit cards. Hence do not forget to carry the hall tickets to the examination. Note: Candidates must also show the identity proof along with the hall tickets. The examination officer will verify the details from both the documents and allow the candidate to proceed with the examination.